Online business meetings bring the world to your presentation or discussion. Unfortunately, online business meetings can cost the human element that makes a sales relationship lasting. Let’s discuss the pros and cons of an online business meeting as opposed to booking meeting rooms. Anywhere, Anytime – Anytime, anywhere, by anyone and to everyone was one of the promises of the Internet. 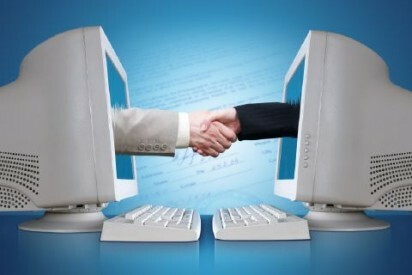 Online business meetings can fulfill that promise. Online presentations can be offered by sales teams around the world, reaching audiences everywhere at once. Economy of Scale – Both the digital broadcasting hardware and receiving hardware in the form of computers have become commonplace, reducing the cost of producing as well as receiving online business meetings. Online meetings also make meetings more affordable to everyone with the hardware to view it. Whether thirty interested experts attend or three thousand potential customers listen in is only a limit of the processing ability of the server. This allows the cost per attendee, if any, to potentially be divided among far more people, reducing the cost per attendee. Interactivity – How do you tell a video you don’t understand? When someone is watching a recorded presentation, it is typically because they need to learn more about the material. When a presentation is televised, interactivity is necessary to be able to ask questions. Digital business meetings, when linked to a human presenter, make it a two-way conversation. In many digital business meetings, attendees can also have side-bar conversations and ask each other questions. The interactivity also eliminates the risk of boredom since each session is unique as well as interactive. Reduced attention gauging – Your avatar is watching – are you? Lack of direct interaction prevents the presenter from being able to gauge the audience’s reaction and attention. Your avatar is staring at the presenter, even if you are in the bathroom or asleep. When a meeting takes place in person, a presenter can tell who is paying attention and who is spaced out. Presenters can talk louder to wake up attendees. They know who to ask questions to and when to get them reengaged. They can switch from pointing to a white board to walking around the room or change to an open discussion when the mood has shifted from attentive to bored. When everyone’s interaction is through avatars or names on a digital roster, that lack of direct supervision of the audience can cause the meeting to be lost. Connection issues – When the connection’s out, so is the meeting. One of the great disadvantages of technology is its reliance on infrastructure that hasn’t kept up with demand. When the connection between the attendee and the presenter is broken, the business meeting stops. This can happen due to an electrical failure at either end. It can be caused by a slow or disrupted Internet connection. Connections can even be broken by simple mechanical failure of routers, switches, and cameras. For those in the physical meeting room, the lecture could continue by moving to a nearby restaurant. For online attendees, the presentation is over when the connection is out. Claire Jarrett owns and operates Marketing By Web, an AdWords Certified Partner in Bristol who works worldwide with clients.